Google Maps allows you to filter out Toll roads, making it possible to save money by avoiding pay to use roads. If this is what you were looking for, you will find below the steps to Avoid Tolls Using Google Maps App on iPhone and Android Phone. For some reason Governments in most countries never seem to have the money to build Infrastructure and Facilities required for people to live, work and contribute to the economy. Hence, they borrow money to build roads and end up collecting Tolls from road users, in order to pay back the borrowed money with Interest. Luckily, you can setup Google Maps on your iPhone or Android Phone to avoid those roads where you may be required to pay Tolls. 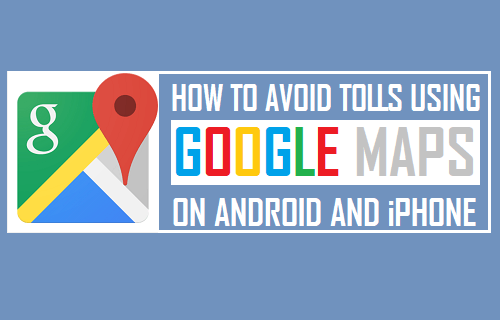 Follow the steps below to Avoid Tolls using Google Maps App on your Android Phone or Tablet. 2. Search for your Destination by typing in the search bar. 3. Next, click on the Directions button located at the bottom right corner of your screen (See image below). 4. On the next screen, tap on Choose starting point (See image below). 5. On the next screen, choose your starting point. 7. From the drop-down menu, tap on Route Options. 8. On the Options pop-up, choose Avoid Tolls option and tap on Done. 9. 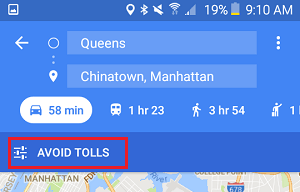 Back on the Navigation screen, you will see that Avoid Tolls Option has been enabled for this particular Route in Google Maps on your Android Phone (See image below). After this setting, you can start heading towards your destination and Google Maps will make sure that you are avoiding the roads where you may be required to pay Tolls. The steps to Avoid Tolls using Google Maps on iPhone are quite similar to those on Android Phone. 1. Open Google Maps App on your iPhone. 2. Search for your Destination by typing in the search bar (See image below). 4. On the next screen, tap on Choose starting point. 7. From the slide-up menu, tap on Route Options. 8. On the Route Options screen, toggle ON the option for Avoid Tolls (See image below). Note: You can also toggle ON the Remember Settings option to make your iPhone remember settings for this particular route. 9. Return back to Maps view by tapping on the Back Arrow and you will see that Avoid Tolls option has been enabled for this Route in Google Maps on your iPhone (See image below). After this, you can start heading towards your destination and Google Maps will make sure that you are avoiding the roads where you may be required to pay Tolls.